The dean of library services at the University of the Incarnate Word (UIW) here in San Antonio has canceled the school’s subscription to the New York Times. This is nuts. It’s the kind of thing I would expect from Jerry Falwell’s Liberty University, not a liberal arts school here in the Alamo City. Oops, sorry, apparently it is now a conservative arts school. After hearing all the partisan ranting from rightwing bloggers and the phony outrage from Bush and Cheney over this story, I’m more convinced than ever that the Bush administration had something to do with getting it disseminated in the first place. I think it was clearly in their interest to let the public know about the anti-terrorism activities the administration has undertaken, especially during an election year when they are suffering in the polls. And then turning around and criticizing the media is a great way for them to fire up their base of supporters. This has all the earmarks of a Karl Rove political operation and it has apparently worked like a charm. No word yet on whether Mr. Morgan has also canceled the school’s subscription to the Wall Street Journal, the Washington Post and the Los Angeles Times, since all those papers ran the same story on the same day. I’m also curious to see if he will cancel the school’s subscription to the local Express-News since they subscribe to the New York Times news service and frequently reprint stories from the Times. I was glad to read further down in the article that library staffers and some students at UIW were outraged by Mr. Morgan’s act of censorship. I also found it interesting that Mr. Morgan was conveniently unavailable for comment after pulling his little stunt because he was “on vacation.” Hmmm. A wingnut and a coward. How typical. I guess he figures students at UIW can get all their news from Bill O’Reilly and Rush Limbaugh just like he does. Somehow I get the feeling that UIW will soon be looking for a new dean of library services. This was a very reassuring court decision today. It means we are still a nation of laws, and we still strive to be the “good guys” wearing the white hats. Commander Charles Swift sums it up nicely. He called today's ruling "a return to our fundamental values." "That return marks a high-water point," Commander Swift said. "It shows that we can't be scared out of who we are, and that's a victory, folks." Two stories in the NYTimes the other day merit further comment as they pile up further evidence that Bush is indeed the Worst. President. Ever. The first titled 'Breathtaking' Waste and Fraud in Hurricane Aid describes the complete and total collapse of fiscal control and oversight by the federal government in the aftermath of the Katrina disaster. Among the many superlatives associated with Hurricane Katrina can now be added this one: it produced one of the most extraordinary displays of scams, schemes and stupefying bureaucratic bungles in modern history, costing taxpayers up to $2 billion. Of course, something like this would not have happened during the Clinton administration because Democrats actually take governing seriously. They put competent and knowledgeable people in place at agencies like FEMA who actually know what they are doing and take their jobs seriously. Republicans see government as an impediment to their buddies in private industry who are just trying to make a profit. Their objective is to weaken government oversight and controls as much as possible and in the case of FEMA they succeeded beyond their wildest expectations. Officials at the Federal Emergency Management Agency and the American Red Cross acknowledged that their systems were overwhelmed and tried to create new ones on the fly. You think so, huh. Some might argue that this outcome was inevitable, but that is not necessarily so. Not a high priority. There’s an understatement. The story goes on to note that “there are bigger cases of government waste or fraud in United States history.” But interestingly enough, all of their examples occurred during the George W. Bush administration. Imagine that! The Treasury Department, for example, estimated in 2005 that Americans in a single year had improperly been granted perhaps $9 billion in unjustified claims under the Earned-Income Tax Credit. The Department of Health and Human Services in 2001 estimated that nearly $12 billion in Medicare benefit payments in the previous year had been based on improper or fraudulent complaints. The other story of note is the one that reveals the U.S. Food and Drug Administration has relaxed its enforcement of food and drug safety laws by more than 50 percent since the Bush regime came to power. The number of warning letters sent to companies in violation of federal food and drug safety laws has fallen by more than half under the Bush administration, according to an investigative report released Monday by a Democratic lawmaker. The drop in enforcement actions by the Food and Drug Administration occurred even as agency inspectors continued to turn up a relatively steady number of industry violations, said Rep. Henry Waxman. I’m disappointed that the majority of the justices think it is OK to allow redistricting anytime the Legislature feels like it rather than limiting it to once a decade as had been the tradition. This is bad news for both parties, even though Republicans will pretend that it is a victory for them. But it is good that they nailed the GOP for their Voting Rights violations, just as the experts in the Justice Department had warned before Bush’s political flunkies overruled them. Daily Kos and Off the Kuff have lots more on the decision. 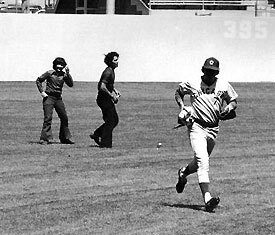 It was 30 years ago that Chicago Cubs outfielder Rick Monday charged across left field at Dodgers Stadium in Los Angeles and scooped up an American flag that a couple of punk kids were attempting to set on fire. That brief moment of patriotic fervor, more than anything else he did in baseball, is what people remember most about Monday today. I remember reading news accounts of the incident when it happened. I was 10 years old and a huge baseball fan. This is how I still remember Rick Monday (a 1973 Topps baseball card that I still have in my collection). The other day, Monday was in Washington, D.C., recounting his flag-saving exploits at a rally in support of a Constitutional amendment that would make flag burning illegal. I am opposed to the flag burning amendment, but I still applaud Monday for what he did 30 years ago. Those protesters were clearly wrong in their actions and there was no need to have a law criminalizing the act of flag burning itself to punish them. They were already guilty of trespassing (the baseball stadium is private property) and disorderly conduct. One of them could have even been charged with assault. It was reported that one of the protesters threw a can of lighter fluid at Monday after he scooped up the flag. If the protesters had wanted, they could have applied for the appropriate permits and held their little demonstration at some public place where they would not have been breaking any laws. But what they craved most was attention and they didn’t care if they broke the law to get it. That should tell you something right there about the potential effectiveness of any laws banning flag burning. Fortunately, today nobody knows who the protesters were or what they were trying to protest one year after the end of the Vietnam War. But everybody knows Rick Monday and that is for the best. The flag burning issue comes up every year around this time. Here is what I had to say about it last year. I still stand by that statement and I hope that we can continue to honor the American flag and patriots like Rick Monday without dishonoring our First Amendment protections of free speech. What the heck is Jonathan Gurwitz talking about in his latest column? Multiculturalism, rest in peace. There may have been no obituary for the notion that every group and every belief in a multiethnic society is deserving of mutual respect and tolerance. But thanks to jihadism, multiculturalism and moral relativism, its necessary counterpart, are now six feet under. Multiculturalism is a public policy approach for managing cultural diversity in a multiethnic society, officially stressing mutual respect and tolerance for cultural differences within a country's borders. So “stressing mutual respect and tolerance for cultural differences” equals moral relativism in Gurwitz’ mind? And what is so bad with having “mutual respect and tolerance for cultural differences” anyway? We already stress essentially the same thing for religious differences. Apparently, Gurwitz thinks because some extremist Muslims have committed terrorist acts in countries that practice “mutual respect and tolerance for cultural differences,” this means that these countries will now stop doing this and will, I suppose, enforce a strict mono-culturalism on everyone. And I’m guessing that Gurwitz thinks this would be a good thing? How much sense does that make? Because of the actions of a small group of Muslim extremists, Hispanics, for example, will now have to abandon their own culture and embrace Anglo-Saxon culture here in the U.S.? Is everyone else as lost as I am now? Multiculturalism created a political morass in which a religious fundamentalist subculture that denied the equality of women and castigated homosexuality could challenge national secular law. Hmmmm. A “religious fundamentalist subculture that denied the equality of women and castigated homosexuality”. Doesn’t that also describe Catholicism? Perhaps they would object to the term “fundamentalist”, but denying the equality of women (i.e. women priests) and castigating homosexuality sounds spot on. Somehow we’ve managed to continue to respect and tolerate religious differences here in the U.S. in spite of the fact that we have had extremist groups like the Branch Davidians and the Christian Identity Movement crop up. Therefore, I predict that we will continue to respect and tolerate cultural differences as well. I can’t blame Warrent Buffett for wanting to give his multi-billion dollar fortune away. I imagine it’s a real pain managing that much money all the time. I mean, what can you do with $40 billion? There is only so much money one can spend on oneself. There is a finite amount of consumable goods a person can consume in one lifetime. It makes perfect sense that Buffett would choose Bill Gates’ foundation to take his money. Who else is better prepared at handling and distributing billions and billions of dollars? Giving away millions of dollars is one thing. But billions? That will corrupt even the best institutions. I asked my wife who she would give the money to and she suggested the church. But churches aren’t set up to handle that kind of money. They need money, but they don’t need the responsibility and headaches that come with handling THAT MUCH money. So the Bill and Melinda Gates Foundation, which is set up to handle just this kind of thing, is probably the best bet for any billionaire looking to unload a big wad of cash that is currently giving him a big pain in his backside.